The top of the hill where the Alhambra stands is more than 700 metres above sea level and is an eroded formation of the Sierra Nevada mountains, close to Granada. This elevated position is the main reason why there has been a fortification here for so many centuries. 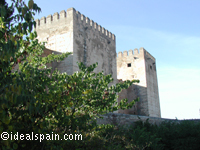 Shaped like a ship, the complex has the Alcazaba at the front, pointing towards the city. The complex covers more than 13 hectares and has a walled perimeter of over 2 kilometres, with thirty towers, some of which are now only ruins. The Alhambra and its gardens makes for one of the best days out in Andalucia and will give you an insight into centuries of history. 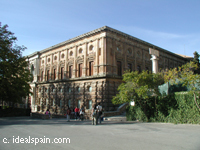 Pictured above and below is the Palacio de Carlos V, a magnificent building dating from the 1500's. 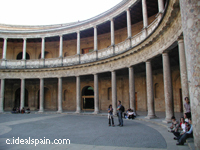 Inside is the central court, of circular construction. The Alcazabar (right) was once an isolated castle and over the centuries has been modified by several builders and has suffered many disasters including an earthquake in 1522 and a thunderbolt in 1882. From the towers, wonderful panoramic views can be had over the city of Granada. 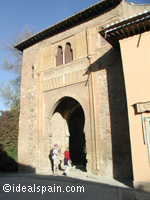 Pictured left is the Puerta del Vino (Wine Arch). This doorway was once the access to the Medina where around 2,000 people once lived. This is just one of many arches and doorways to be explored. 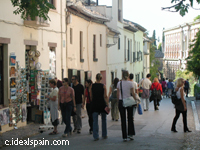 Within the Alhambra complex you will find several gift shops, bars, restaurants and very good toilets. Local crafts can be bought from the small shops and you can post your special letters from the bookshop. Tickets are 7 euros  for EU citizens but you need to produce your passport as proof.